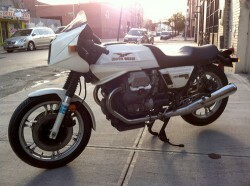 A very nice Moto Guzzi LeMans III is up for sale on eBay, but time is short! The LM III was made between 1981-1984, so this is the last year of this particular bodywork. I prefer the Mark I’s, but this is definitely my favorite of all the later LeMans bikes and it looks very sharp in white, like crisp origami. While not a complete, ground-up redesign, the LeMans III was a major reworking of the flagship model, whereas the LM II/CX100 was primarily a cosmetic upgrade. 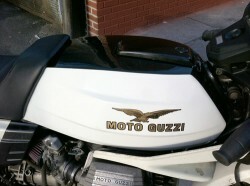 The LM III incorporated new square cylinder heads that set the style for Guzzi motors through today and, though the compression was decreased slightly, torque and horsepower were both increased slightly due to improved breathing and superior manufacturing techniques employed during production that made the most of the existing design. While the styling maintained the sleek café pose and bikini fairing of the original LeMans, it was updated with a significantly more angular look that was developed in Guzzi’s wind tunnel: note the small winglet spoilers that were intended to deflect air over the cylinder heads. 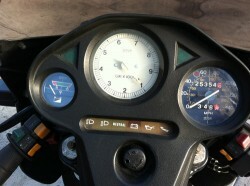 The dash was significantly changed, from a bare-bones pair of gauges to a much more modern dash made of rubber that was touted as a safety feature and featured a very classy white Veglia tach paired with a smaller speedo and voltmeter. 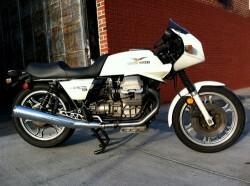 The ad is very comprehensive and suggests a knowledgeable owner: 1984 Moto Guzzi Le Mans III for Sale. I bought new additional parts parts including a stucchi seat, as well as new parts to recondition the carbs which have all been installed. 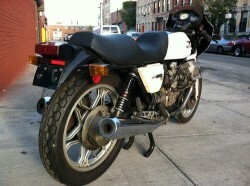 The most I’ve ridden this bike is about a few miles or so since I’ve had it and I just don’t have time to enjoy it. Some finishing is needed in regards to setting up the carbs. All the parts are new inside of the Dellortos, except for the slides which I also wanted to replace, but MG Cycle didn’t have them in stock. The bike runs a little rough at idle and I think the float heights need to be set as well as the carbs needing to be synched. 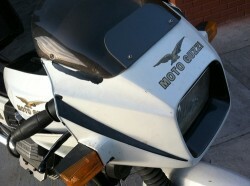 When I was riding it and rolled on the throttle, it pulled great. The original floats were 10g, but MG Cycle only had 8.5g floats…I’m not sure if the lighter floats made a difference to the way it runs at idle.